Cleaning gutters can be a frustrating, dirty, possibly dangerous, and exhausting chore, so let us handle it instead. Our gutter cleaning services include removing all debris from your gutters and downspouts. After we are done, we clean up all the debris so we don't leave a mess on your property. Our gutter cleaning is offered throughout Birmingham, Royal Oak, and Troy, Michigan. Clogged gutters can lead to overflowing, which can damage your home in many different ways. 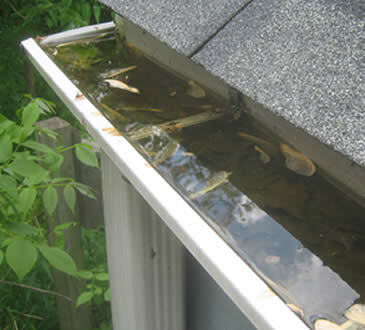 Our gutter cleaning services include removing all debris that have clogged your gutters. We also test all of your downspouts to ensure that they are flowing properly. Some people believe that gutter cleaning is something to do simply for aesthetic reasons. In fact, cleaning your gutters is necessary to avoid possible water damage to your home. 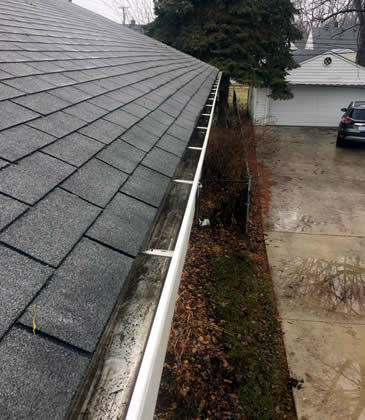 Gutter cleaning may seem like something that you can put off for some time, but by ignoring it you could face some heavy expenses. ➤ Water may seep into your basement and cause the wood in your foundation to rot. ➤ During winter, the water that may that have accumulated in your foundation may freeze and crack your foundation. Also, a waterlogged house can introduce health hazards to you and your family. When the water reaches higher levels of the house it can cause rotting and mold. This mold can cause many respiratory problems when inhaled.